HALF-MINUTE HORRORS is a compendium of short stories, poems, and illustrations that can, as the title suggests, chill your bones in 30 seconds or less. Edited by Susan Rich, the collection boasts such authors as Lemony Snicket, Neil Gaiman, Joyce Carol Oates, R.L. Stein, and Gail Carson Levine, ensuring a variety of scares and spooks for any kid. 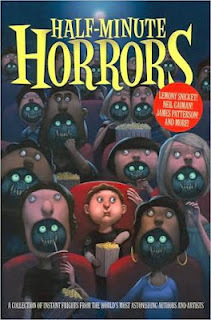 For kids, “Half Minute Horrors” covers nearly every base of scariness: aliens, monsters under the bed, talking animals, ghosts, and shapeshifting. Each story is extremely entertaining, and while some are more effective in their creepiness than others, the ones that succeed are worth the money. Kids who love scary stories will eat this collection up, particularly due to the stories’ short lengths, which can satisfy any attention span. For younger or more squeamish children, glance over the stories first! “Half Minute Horrors” is the perfect book for autumn as children begin to get excited for Halloween. You can read it at Halloween parties, savor a story per night to keep the anticipation for the holiday high, or devour it in one sitting. Remember to keep a flashlight handy for an extra ghoulish effect.